Be Well Solutions is a physician-owned, comprehensive wellness company. 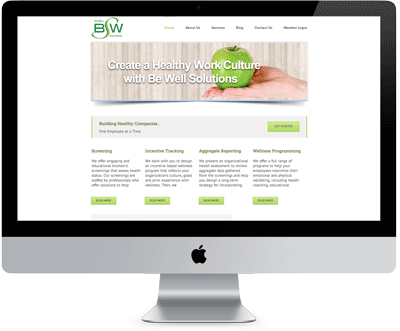 Be Well Solutions specializes in full-service wellness including bio metric screenings, health risk assessments, wellness programming and intervention, compliance tracking and aggregate reporting. Develop custom web-portal with individual user account management, wellness data management, wellness training, company aggregated data reporting and dashboards, and full back-office administration. We offer engaging and educational biometric screenings that assess health status. Our screenings are staffed by professionals who offer solutions to help participants prevent major health problems. We work with you to design an incentive based wellness program that reflects your organization’s culture, goals and prior experience with wellness. Then, we implement and track the program for you. We present an organizational health assessment to review aggregate data gathered from the screenings and help you design a long-term strategy for incorporating good health into your organization’s culture. We offer a full range of programs to help your employees maximize their emotional and physical wellbeing, including health coaching, educational seminars and wellness campaigns.